All the advice on writing seems to be about point of view, character development, story structure, how to grab the reader in the first sentence, and so forth. They never mention ski tubes. These 24-inch long acrylic and Lycra loop pile socks are the answer to the cold air that seems to gather beneath any writing desk. A memory foam seat cushion was another eBay find for me. Vitamin D supplements might be a good idea if you never see the light of day. 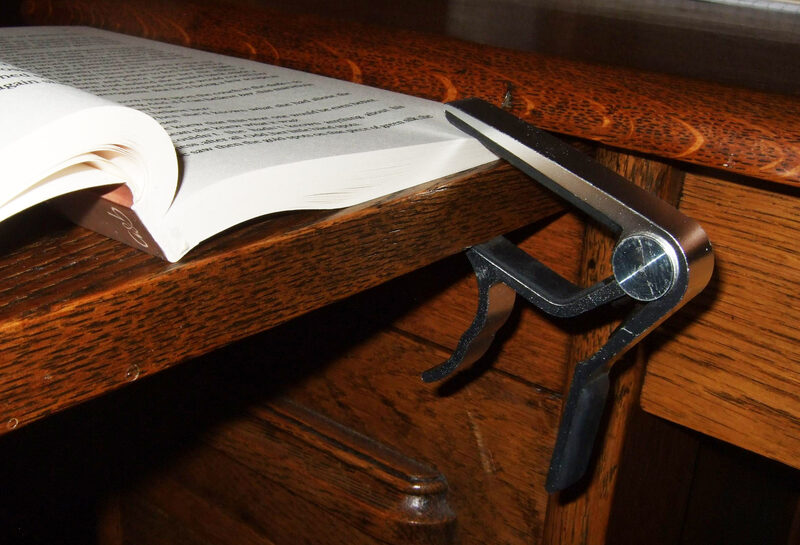 And a guitar capo, or two, can be a good way of holding open a book. It’s trendy to mock ‘Elf ‘n Safety’, but actually it was invented to stop people being damaged by their working conditions. If you spend more than an hour a day continuously working in front of a computer, you’re a DSE (Display Screen Equipment) user. Read the HSE checklist and find out how to set up your workspace properly. Especially getting your seat, keyboard, and screen at the right heights. You could save yourself a bad neck, a bad back, and pain in your arms and hands. And don’t forget the insulated coffee cup and the biscuit box!